With the increasing secularization or more specifically desacralization of mainstream culture, many of the uplifting values that comprised the core character of respectable people in the past have been divorced from the fabric of the spiritual worldview on which they had been based. Thus, for example, many sociological surveys have pointed out the positive effects of the feelings of gratitude – gratitude helps us psychologically and physically. But contemporary culture simply asks us to feel grateful without identifying whom to feel grateful to. Certainly, having an attitude of gratefulness in general as against an attitude of discontent is good. Yet to be grateful in general is like to be married in general. To be married is a state, but that state is defined by being married to a particular person. When we thus become spiritually aware, we realize that though gratefulness is definitely a positive quality to have, we block our spiritual evolution if we keep it depersonalized. We need to recognize that whatever blessings we have, whatever things we feel grateful for, they come from some source – not just their immediate source in this world, but also the supreme source by whose arrangement the worldly sources have come in our life. The Bhagavad-gita (09.10) states that material nature works under Krishna’s supervision. Gita wisdom further explains that all blessings, all the things we may feel grateful for, come from Krishna and, more importantly, that Krishna himself is Krishna’s greatest blessing. That is, to become attracted to Krishna and to live absorbed in him is the greatest blessing, for it enables us to find enduring fulfillment. He is the embodiment and fulfillment of all our heart’s aspiration for beauty, love and joy. 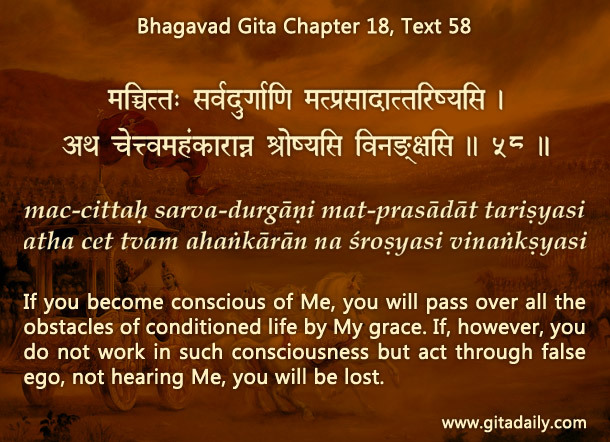 The Gita (18.58) assures that by becoming conscious of Krishna, we can pass over all of life’s obstacles.